If you can’t tell from my previous posts, I’m a big fan of old, Italian bikes. But in all honesty, anything with wheels moves me. I mostly find vintage Japanese bikes to be a bit awkward-looking, like they were still trying to find a solid design language back then. But sometimes sheer insanity wins out over an elegantly-styled, well balanced design with an impeccable pedigree. 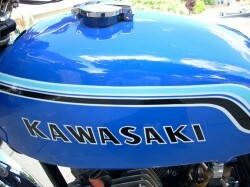 The Kawasaki two-stroke triples certainly are attractive machines, if only for the aura of danger that surrounds them… Nicknamed the “Widowmaker”, the original H1 was an intoxicating concoction: brutal power delivered over a short, two-stroke powerband, primitive brakes, and a frame that flexed frighteningly. 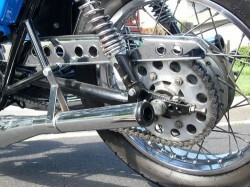 Unintended wheelies, scary cornering and high-speed wobbles were common and fuel consumption below 20mpg was reported. These things really are the two-wheeled equivalent of the muscle car: they don’t stop, they don’t turn, but they sure go fast in a straight line. 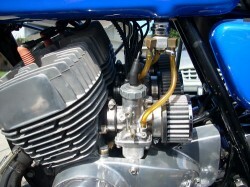 The motor originally displaced 500cc in the H1 Mach III but grew to 750cc for the H2. Basically, a scaled-up H1, it was even more likely to overwhelm its underwhelming suspension and brakes. It weighed in at about 450lbs and made about 75hp. Not too impressive now, but these things absolutely ruled the drag strip in their day. Some I’ve seen wear twin front discs, making you fifty per cent less likely to die in a fiery wreck when the frame flexes like al dente pasta approaching a corner. Unfortunately, the one shown here for sale has only the single front disc. this bike was built by the guru of triples, tony nicosia in the late 80’s,in his HOT BIKE ENGINEERING shop in fremont california. I have a folder of receipts to prove ALL the work he did to the motor, and the receipts for various parts from me and the last two owners. The motor was given Tony’s VIPER kit, which is a stage 2 porting and polishing kit with 34mm mikuni carbs ,wiseco pistons and rings, crankshaft rebuilt by fred gast,ie [fast by gast} in NEW YORK. This bike is not stock obviously and runs VERY, VERY STRONG. 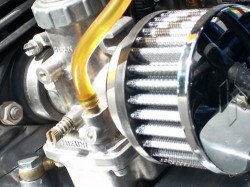 Also it has barnett racing clutch , which is SUPER strong and stiff to handle the horsepower. It’s a mans clutch. See? 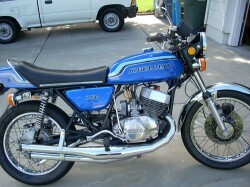 I was right: it’s a man’s bike, with “a man’s clutch”. He claims 100hp from this modified motor. The ad has an extensive list of modifications and work that’s been done to the bike, including receipts. 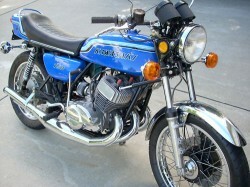 In any event, these have been around forever and have never been all that expensive, so it’s not easy to find one in nice, tastefully modified condition, although the bike’s reputation and rarity are driving prices up. This one is currently at almost $8,000 with the reserve not met. That’s a lot of cheddar for one of these, but the list of work done suggests that, if you’re looking for the perfect Widowmaker, your search may be over. Previous story Flashback! Quick Medley from the 80s!